Oh my Kate Spade obsession. Let it get fuller and richer and completely robust! Bring on the purses, the wallets, the cellphone covers, the whimsical jewelry and awesome clutches (so off subject but she has the cutest champagne bottle clutch for the holidays…I have absolutely no where to use this awesome clutch but oh how I want one!). 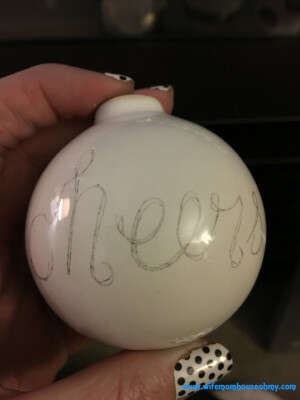 And yes, bring on the ornaments! I already shared my love of her Woodland Park series but it was her Deck the Halls series that I first fell in love with. I first saw them on an HGTV magazine cover (I guess that’s where my obsession began.) paired with red and turquoise ornaments. The wonderful play of black and white in a modern but traditional form. These glistening white orbs covered with perfect black stripes and black spots and the fun festive lyrics of fa-la-la-la. 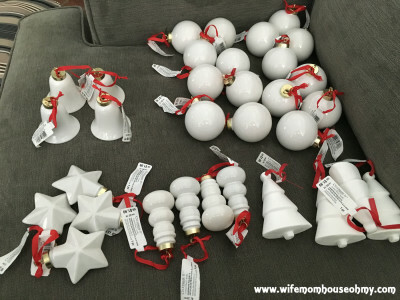 As I said in my previous Kate Spade ornament post, Michaels had a huge collection of ceramic do it yourself ornaments that were perfect bases for all my Kate Spade ornaments this year. And at $1.99 each, with a buy one get one sale and a 25% off coupon, they ended up a whopping $0.75 each. 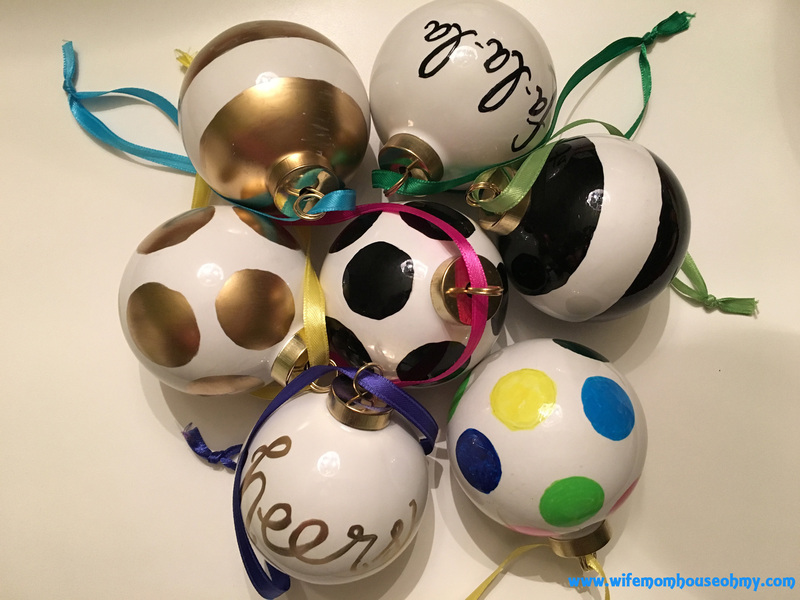 A failed experiment with Martha Stuart acrylic paints (love the paints just not right for the project) treated me to an extra trip to grab some paint pens and I was off and running with my latest DIY Christmas project. 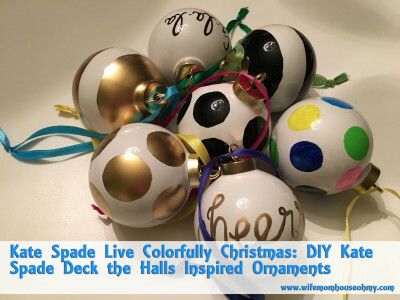 These Deck the Halls recreations and inspired ornaments are actually pretty simple. Like their Woodland Park counterparts, just a little time consuming so give yourself time if you are taking them on. I removed the ornament tops on all of the ornaments. 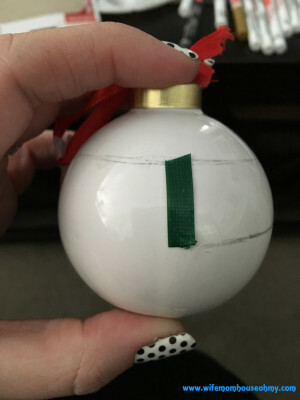 For the dot ornaments, I first added stencils to the ornament. For the black and gold dots, I used the inside of my tape roll and for the color dots, I used yard sale circle dot stickers and traced the circles in place in pencil. I wanted to have two different sizes but you can do just one size if you prefer. Next, I removed the circle dots of the ornaments slated for multi-color dots. Then, I simply used the paint pens to fill in the dots. Add the ribbon to the tops of the ornaments and put them back in place. All done. As I said, simple. The word print Kate Spade knock-offs were even easier. First, I freehanded the words I wanted. 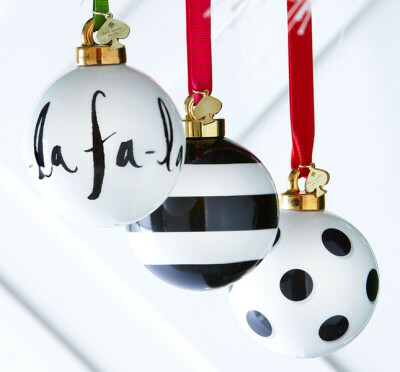 For the black and white ornaments, I went with the exact phrase from the Kate Spade Deck the Halls – fa-la-la. For the gold, I opted for cheers. For both, I did the wording in pencil tweaking it till I liked it. Then I simply traced my writing with the black or the gold pen. Put the tops back on and added the ribbons. Again, simple and done. The stripes were a little more complicated. First, I took a small piece of tape and used it to establish the width. Then I slowly moved it around the ornament marking the bottom to make connection points. Then I connected each section making a circle around the ornament. I repeated this process for each line. 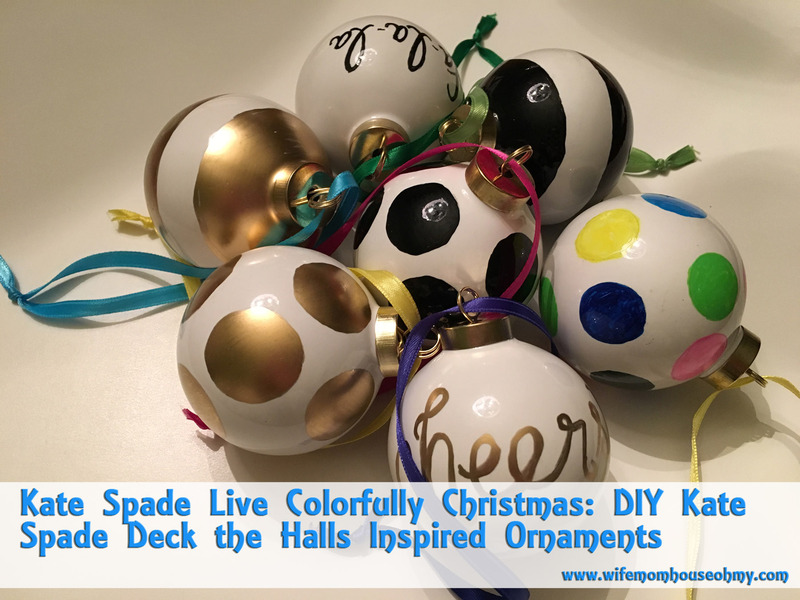 Then as with each previous ornament, I simply filled in each line with the paint pens. Added the ribbons and the tops. All done! Super simple. Not super fast but super worth it! Can’t wait to get them all up and hanging on my tree.